1. Bodum Chambord French Press Coffee Maker - because who wouldn't want to wake up to the perfect cup of coffee? 2. Now and Then: The Cabinet Card Paintings of Alex Gross - a fun collection of mixed media paintings done on top of antique 19th Century cabinet card photographs, vintage and wacky all at the same time. 3. Fresh Sugar Kisses Mini Lip Trio - amazing lip balms in three mini colors. Perfect and pocketable. 4. Baggu Medium Leather Pouch - big enough for your wallet, phone,and other odds and ends, it works either as a stand alone clutch or to ease purse-to-purse transitions. 5. Mason Jar Snow Globe - traditional holiday happiness with a rustic feel. Or better yet, make your own. 6. Leather Key Holder - because everyone has keys. 7. The Lumineers - part folk, part rock, part pop, wholly fabulous and addictive, it's one of the best albums I've heard all year. 8. 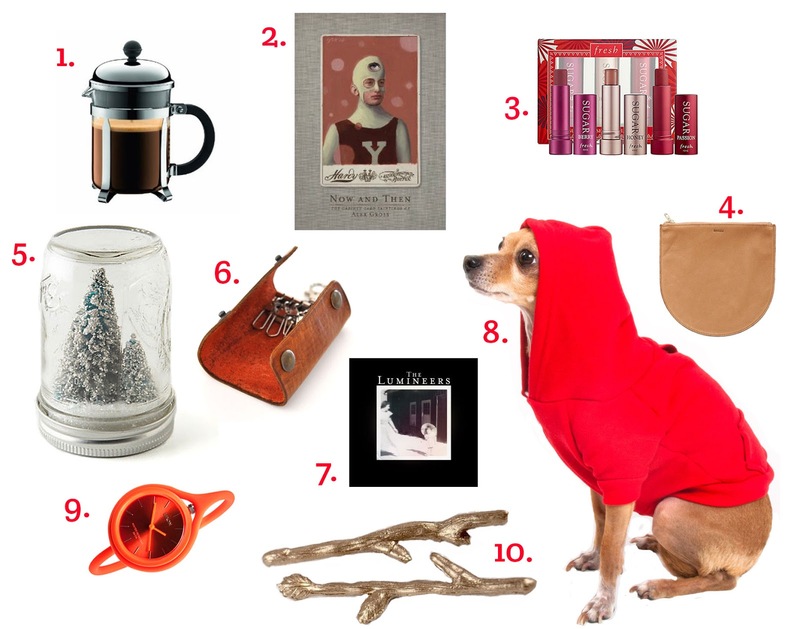 American Apparel Fleece Hoodie - for the canine on your list. Or the canine lover. 9. Take Time Watch - ingenious watch from the MoMA store that can be worn on your wrist or hanging from a bag or belt loop. 10. Twig Hair Pins - because every woman has a touch of woodland fairy in them. Esa chaqueta roja que me comentabas no tengo ni idea de dónde es, lo siento mucho! I love our leather key holder. Those twig pins are cute.